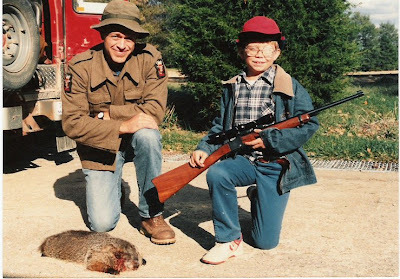 Yep, that's my father, me and a groundhog having a bad day. I'm afraid I can't take credit for the shot though. If the glasses and eyepatch are any indication, I couldn't have hit the broadside of a barn at the time...even with that lovely Ruger .223! Looks like a proud daddy and a proud son! Great picture. BTW: Welcome to the Gunblogging world! Someone must need an engineer in Reno next October, so you can make it to the Gun Blogger Rendezvous! Even as a youngin' you had impeccable posture.